South Korea: a nation of kaleidoscopic vibrancy with a prowess to hypnotize any unsuspecting visitor with its technicolor features. While many might associate the Asian country with the colors of grey concrete, black smog, and neon, there's much more to the palette that illustrates the colorful attributes that make up Korea. Wanting to prove this, I asked a number of Korea bloggers to come together to participate in a unique blogging project to share with the world the beauty of South Korea's food, culture, and destinations through the use of color. Much to my surprise (and delight), some of the best bloggers in Korea agreed to contribute to the project, aptly named "The Colors of Korea." For the project, each participant chose a color and wrote a post to illustrate the aspects of the country that he or she felt were representative of his or her color. Some colors required using extensive creativity and thinking outside the box, and all the participants went above and beyond my expectations in doing so. The end result of their efforts is a prismatic compilation of stunning photography and fantastic written content that beautifully portray the colors of Korea. Read below for a preview of each color and links to view each blogger's full post. Red : As a Korean American, Jace Im from Lost in the ROK writes with a unique insight and humorous opinions regarding various aspects of Korean culture. For this project, his observations are just as interesting as he explores the shades of red through Korea's fiery food, feisty city folk, fierce soccer fans, and passionate love rituals. Feel the burn? Pink : Busan-based blogger Maddie Lamb of Head High Heart Strong is known for her posts that illustrate the softer (and cuter) side of Korea. From lanterns to hanbok to Hello Kitty, she appropriately conveys the country's femininity and will have you thinking pink before you can puff out your cheeks say, "Oppa!" Orange : My (Seoul Searching's) contribution to the project was all about orange: persimmons, autumn leaves, and jjimjilbang pajamas. Oh, and burning BBQ coals, which you'll be glad to see if you're a guy that just took in too much pink. Orange ya glad ya didn't say "Oppa"? Yellow : Hailing from London, Ken Lum Lee is currently teaching in Gwangju and despite being relatively new to blogging, his blog, Seoul State of Mind, has quickly gained popularity amongst photography fans. Ken captures the yellows of Korea- canola flowers, bingsu, and chamoue- in a surprisingly romantic fashion. Maybe his pretty female model has something to do with it? Blue : Brent Sheffield has quickly gained notoriety for his stunning photography and witty commentary on his blog, Kimchibytes. His writing covers just about everything, from travel to profiles on Korea's English teachers over 30. 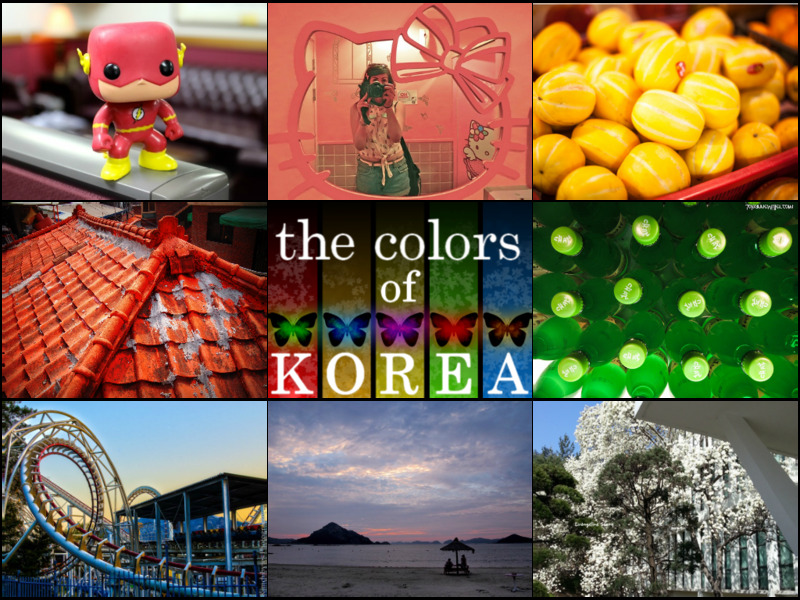 Brent shows off his philosophical side in his contribution to the "Colors of Korea" project, where he highlights the country's beaches, pop culture, and fashion. Zoolander would be proud. Purple : Sarah Shaw, a Korean language student at Geumgang University, is the brains behind Mapping Words, a blog that is sometimes controversial but always entertaining. She did not hold anything back when writing her piece for this project (and I love her for it) that includes purple bokbunja, purple ajumma, and purple... labia. Don't ask. Just read. White : Bora "June" Lee of Evageline Story is a popular Korean blogger and the only local amongst the project's participants. In her post, she captures the beauty, sadness, and fierceness of white through her images of snow, ssireum, and spring blossoms. So, there you have it, folks. A full spectrum of South Korea's colors represented through the country's food, destinations, and culture, compiled by bloggers with a passion for the beautiful country. What colors do YOU think of when you think Korea? Did we leave anything out? Leave your comments below. I would personally like to extend a sincere thanks to all the bloggers that participated. Although many were busy with surgery recoveries, nursing practicums, international travel, and personal studies, they each put a great deal of effort into their individual posts. If any Korea bloggers are interested in participating in future collaborative blogging projects, please contact me. The colors of Korea are: White, Black, Grey. All buildings and cars are mostly the same color. "asking koreans" Well, that's a dumb move, of course they will talk different and make up things, like they do everyday with them faces. This is only a warning, not a reply. Don't feed the TROLLS, dear friends. trolling? I'm not telling nothing really different from reality. Go to Seoul, everything is grey. even the author of the blog admitted at the start of article. And well, the author asked for our opinion about Korean colors, So did I. and mostly based on reality. Korea is full of colors and life! I have loved my experience here, and would enjoy getting involved on future collaborative blogging projects! Fantastic work here, Mimsie! I follow you on Instagram as myseoulexposed as well. Chase, thanks for your comments! I would LOVE you to join in on future blogging projects. Will be in touch and will continue to enjoy your photography through Instagram, as well. Thanks again! I would love to join you in any blogging projects. I am now living and Korea and i enjoy exploring Korea!